File History is a new Windows 8 feature allowing recovery in an event of system crash. File History feature is similar to System Restore but it allows you to store backup of files on external drive like USB pen drive, external hard drive and so on. This feature allows you to create backup of library, desktop, contacts and favorites. Since backup is stored on external drive, in an event of crash you can restore and recover more easily as compared to backup stored on same hard drive (or partition). 1. 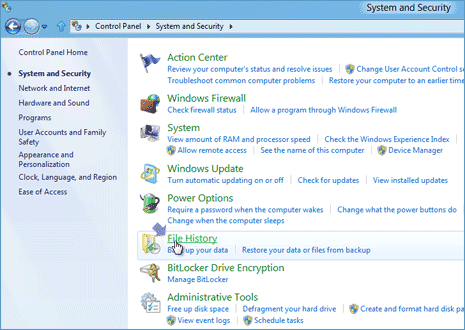 On your Windows 8 computer open Control Panel and then click ‘System and Security’ option. Then in the listing on System and Security page click File History option. 2. This will open File History settings. By default File History feature is disabled on Windows 8. You need to connect external drive (like USB pen drive or external hard drive) to computer. Then open File History settings window again. 3. Click Turn ON button next on File History settings page. This will enable File History option and now you should see status ‘File History is On’. A folder named ‘File History’ will be created automatically in external storage device containing files backup. 4. You can customize Advanced Settings like choosing how often to save copies of your files and how long to keep saved sessions. Select the required settings of time (in hours and minutes) and days (in months) from drop down boxes. 5. There is also option to exclude specific folder from the File History backup routine. For example: you can exclude your temporary downloads folder from File History backup as they may not be required for restoration even in event of system crash. 6. You can use change drive option to changing current external drive being used for file backup. Just click Add Network Location to select different drive. This option also allows you to select local partition drive for storing file backup (though not recommended). Since backup is stored on external drive, there is least possibility of losing out on backed up files when they may be required for recovery after system crash. This for sure is recommended feature one should enable while using Windows 8 operating system powered computer.